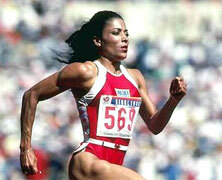 1959 – Florence Griffith-Joyner Born. Florence Delorez Griffith Joyner was born on this date in 1959. Nicknamed Flo-Jo, Griffith-Joyner was considered by many to be the faster woman on Earth as she still holds the world record for both the 100 and 200 meter dash, set in the 1987 World Championships and the 1988 Olympic Games respectively. She was married to Olympic triple jumper Al Joyner and the sister-in-law of the heptathlete and long jumper Jackie Joyner-Kersee. Joyner served as the head coach of the University of California at Los Angeles track team and Florence transferred to the school where she ran track and she graduated in 1982 with a degree in psychology. A park near her neighborhood was named in her honor by the City of Mission Viejo.